Thank you to our dear friends Linda Litowsky and Dean Lofton at ChannelAustin for producing the following public service announcement on behalf of Symphony of Soul! Symphony of Soul is honored to provide “live musical medicine for the soul” to the young patients at Dell Children’s Hospital. Looking so frail in their hospital gowns with IV tubes attached to their arms, the children slowly trickle into the activities room for the Symphony of Soul performances. Nurses and family members steady them as they walk or push them along in a wheelchair. It breaks one’s heart to witness their vulnerability. Warmth quickly fills the room, however, as the music begins and the smiles spread across the faces of the young patients. We all tend to feel so helpless when a friend or loved one is in the hospital. How do we help? What should we say or not say? What should we do or not do? It’s hard enough to know how to handle such tender situations with adults, but with children, it can feel unbearable and overwhelming. The questions loom much larger: How do we help this vulnerable little child? How do we comfort his terrified mother and father? “When Zach was born, the doctors came to tell me that he wasn’t urinating. After a few hours I was told that his insides looked like scrambled eggs; he didn’t have a bladder; one kidney was 10 times bigger than the other; his heart had a hole in it; and they gave him a 1% chance of surviving. I was devastated! I knew in my heart that he had a purpose and was going to survive! Zach had 10 surgeries in the first year of his life. During that time, we lived at Children’s Medical Center in Dallas. There is so much to absorb when your child is born with any challenge, but being a single mom, and without much family support, it was up to me. Zach slept on my chest the first few months in order to hear my heart beat. As he grew, the doctors were encouraged but still very concerned about his chance of survival. My personal faith and the grace of God are the foundation of our story. The relationship with the medical community – the doctors and nurses – is a special ingredient. It is so important to work with them. We are all a team trying to extend the life of the child. The relationship with the other moms and finding a support system was also very important. I would sit with a stuffed dog snuggled up in my arms while Zach was in surgery. The other moms started doing the same. It gave us a sense of comfort! As Zach got older, I was able to decorate his room with kites hanging from the ceiling, GI Joe figures, plants, and a lot of colored construction paper. It softened the sterile environment of the hospital room. I found that a lot of my friends couldn’t handle it. A few would come up to see us but were then overwhelmed seeing all of the children with their challenges. It would hurt my feelings but I accepted the fact that, until you go through something like this, you have no idea how it feels. We need the support of family and friends. If there isn’t any family, you make friends with the other mothers and you support each other. Sue Ann shared with me that nurses and doctors can make a positive or negative impact on the children and families, depending on their people skills. The aloof or arrogant doctors and other medical personnel only add to the extreme anxiety that the families are already experiencing. But those who are warm and tender and who take the time to communicate with compassion can have a very positive impact. With this in mind, I am happy to report that my lovely half-sister Dr. Mary Kathryn “M.K.” Hyland Eagleton has begun her residency at UT Southwestern-Austin in pediatrics at Dell Children’s Hospital. Needless to say, I am very proud of M.K. and I know that her brilliant mind, combined with her sweet, humble and gentle demeanor, will have a very positive impact on everyone around her at Dell Children’s, most especially the young patients and their families. In addition to having compassionate caregivers such as M.K. on the premises, Sue Ann assures me that our Symphony of Soul musicians are providing a wonderful gift to the children and families whenever they perform at Dell Children’s Hospital. There is nothing like music to lift the spirits of those who are in physical and emotional pain. The families of the young patients say time and again that it comforts them to see their fragile son or daughter smiling and singing along with the music. Sue Ann shared with me that when Zach was in the hospital, “People would bring their guitars and sing. Music brings life to these kids,” she said. I look forward to hearing more of Sue Ann’s story, for I know it will be a valuable source of insight for us all. In the meantime, Symphony of Soul will continue serving the precious children and their families with love, compassion and, of course, “musical medicine for the soul”. The musicians on the Symphony of Soul roster often ask me how they should conduct themselves with the clients who have Alzheimer’s and Dementia. As you know, we bring live music to everyone from infants to senior citizens facing challenges ranging from cancer to homelessness to mental illness to drug & alcohol addiction and more. We serve very fragile populations and it is important to treat our clients with courtesy and respect. Relating to someone with memory impairment can be an especially daunting task for someone who isn’t experienced with this particular population. Fortunately or unfortunately, I have a great deal of personal experience with this population, both through my 11 years of running Symphony of Soul and through my 7-year walk alongside my beloved mother who is now in the advanced stages of Alzheimer’s. I am no medical expert, by any means, but from my heart to yours, I will share with you some valuable lessons that I’ve learned along the way. A person with memory impairment is like a child. Gradually stripped away of all skills, talents and high brain functioning, they gradually regress from high functioning adult to teenager, to grade schooler, to toddler, to infant – but never in any particular order. If you love children, you will love the folks with Alzheimer’s and Dementia, just as I do. They can be hilariously playful and funny and wonderfully tender and affectionate, just like a child. Every day and every moment is brand new for them, just as it is for a child. And, yes, just like small children, they sometimes have temper tantrums, anxiety and tearfulness over seemingly small things. They have trouble expressing themselves in words due to a limited vocabulary, get frightened of things they don’t understand, and pick up things that look interesting to them – even if it’s your purse! As the disease progresses, just like small children, they might wear odd combinations of clothes, get food everywhere when they eat and become cranky when they need a nap. Like most children, they are starved for attention. We must be willing to enter their world, wherever they may be in that particular moment. At one care center, some of the women love to walk around with baby dolls. Some days, the baby dolls are merely toys to them but on other days, those baby dolls are real babies. It would be cruel and inappropriate for us to shame and criticize them and say “That’s not a real baby! That’s just a doll!” The loving choice is to say “Oh, what a beautiful baby! What’s her name? May I hold her?” This honors the dignity of the person with Alzheimer’s. As a general rule of thumb, never shame or criticize them. They see the world through the eyes of a child and our job is to treat them with the same gentleness and patience we would a child. There is one caveat, however: they aren’t children. They are adults who have lived long, rich, productive lives and it is important to honor their dignity and treat them with respect. Therefore, we must never patronize them or talk about them right in front of them as if they aren’t there. I also cannot stress strongly enough that we must never, ever try and force them to face the reality of their disease! People with this disease, especially in the early stages, have a great deal of self-protective denial – and for good reason! It is terrifying to feel your mind going away, to wake up not remembering who you are, where you are, or why you’re here. In the early stages of the illness, people have moments of functioning well and moments of feeling completely blank of all understanding. In my personal opinion, this is the worst part of the disease for them because they are aware enough to know that something is wrong with them but too terrified to face the dreadful reality. There is no cure for Alzheimer’s or Dementia. It gets worse and worse until the patient ultimately dies from the gradual shut down of the brain and all bodily functions. Forcing someone to try and face that horrible reality is cruel and pointless, not only because of the grim reality of the disease, but because the disease strips away one’s mental and emotional capacity to cope with reality. It would be like forcing a small toddler to face the fact that she’s dying of cancer. The poor child would be frightened and traumatized yet with limited ability to understand what is happening to her. As the disease progresses, our loved ones with Alzheimer’s and Dementia pass through all awareness to a place of no longer being aware that anything is wrong with them. At that point, they will live more fully in the present moment and they will feel more and more at peace. This is truly a blessing. From there, simply redirect them. Distract them by pointing out that beautiful bird resting outside on the window sill or suggesting you take a walk in the garden together to admire those beautiful roses. Laughter is absolutely the best medicine. If you can find something funny to laugh with them about, they will often forget their worries. And, of course, music is always the best distraction, but I’ll go into that later. Yes, you may go through such routines of comforting them and redirecting them several times in the course of an hour but the goal, always, is to keep them safe, peaceful and content. Comfort them and redirect their attention to something that makes them happy. From a spiritual perspective, our loved ones with Alzheimer’s and Dementia are our greatest teachers. How many religious and spiritual teachings encourage us to live in the present moment? We are encouraged to let go of the past and stop worrying about the future, for all we really have is the present moment. Our friends in the 12-step programs encourage us to live “one day at a time” and, for someone in the throes of addiction, that might mean living “one minute at a time” or “one second at a time”. Who better exemplifies living in the present moment than children and people with Alzheimer’s and Dementia? Our Jewish and Christian friends remind us of Psalm 46:10 that says, “Be still, and know that I am God.” Our Buddhist friends encourage meditation to help practice this inner stillness and to learn the value “being” in the present moment rather than “doing”. As one who has practiced meditation for 25 years, I can tell you that I still find it very challenging sometimes to just “be”! No matter what method of meditation I’ve tried, it always proves to be difficult because we “healthy” humans are wired to get out and “do”! As a Christian, I have felt most at home practicing the form of meditation knows as Contemplative Prayer for the last 8 years. Even so, I am faced with the same challenge of sitting in the silence and “being”. Our worldly perspective is to achieve, achieve, achieve! We want more “success”, so often defined as more stuff, more status, more money, more fancy cars, more designer clothes, more, more, more! But we are reminded in various religious and spiritual teachings that none of this brings us true and lasting happiness and we certainly don’t take any of it with us when we die. We are taught that the things we focus on the most are the things we truly do worship the most. As the insightful author David Foster Wallace points out in his book This is Water, “An outstanding reason for choosing some sort of God… is that pretty much anything else you worship will eat you alive.” If we spend all of our time and energy on our job, then that is what we really worship. If we’re obsessed with getting more and more money, then that is what we worship. If we are addicted to alcohol and we live for our next drink, then that is what we worship. The Bible encourages us to “come like little children to the Lord” Matthew 18:3. To me, this means that we must let go of our worldly cares and our adult busy-ness and move into a pure state of childlike openness, playfulness, being-ness, awe and wonder. It is hard to know God when we are so caught up in our busy adult lives and striving to achieve and acquire. We miss moments of the divine when we remain so caught up in our mode of driving ourselves so hard. What greater example of adults “being” as children and “living in the present moment” than our friends with Alzheimer’s and dementia? It is the spirit of playfulness and innocence that opens the door to moments of Heaven or Nirvana here on earth. Could it be that our friends and loved ones with Alzheimer’s and Dementia are closer to an experience of God than those of us who are “healthy”? It is in my frequent visits with my pastor Barbara that I have come to view Mom’s disease as an opportunity for spiritual growth. Barbara encouraged me to watch Mom closely and “see how she does it”. I was mystified at first but now I understand what Barbara meant. In the worldly sense, it is devastating to see my mother’s decline into the disease. Selfishly, I often miss being able to share experiences with her and confide in her like I used to. Like anyone, I have my days of darkness and despair over Mom’s illness. Sometimes the grief comes out of nowhere and I find myself doubled over in tears, unable to control the sobbing. From a spiritual perspective, however, I see that Mom is coming “unto the Lord” as a child more and more every day and I know that she is showing me how to deepen my own relationship with the creator. When I remember to turn back to my faith, I am able to see beyond my selfish worldly desires and know in my heart that Mom is in a process of moving closer to God – and I have the great honor of watching, learning and witnessing “how she does it”. I accept each moment with Mama as a gift. Just curling up to her and holding her allows me to cherish her essence. Sitting outside in the garden and holding her hand while we watch the birds fly by is a kind of meditation in and of itself. I get to practice being in the present moment. Laughing with Mama over the silliest childlike things is wonderfully refreshing to the “on-top-of-it” adult part of me that’s so busy getting things done. And, of course, there is no greater magic than singing with Mama. She has a beautiful voice and she loves to sing. Besides physical affection, singing is our greatest means of connecting with one another at this point in her illness. She may not be able to converse with me much anymore now that her use of language has fallen away. But if I softly sing a song that she loves, she will sing along with me. As if by magic, language comes back to her. St. Augustine said, “Singing is praying twice”. Indeed, like most people with Alzheimer’s and dementia, Mama may not be able to speak with ease, but she can still sing God’s language of music, the “speech of angels”. Surely, when we sing together, we are “praying twice”. So many people suffer nowadays with friends and loved ones in care centers for Dementia and Alzheimer’s. Some people visit their loved ones a great deal and others avoid visiting because it is too devastating to see their loved one in that condition. The frequent, painful lament is that Mom or Dad “isn’t there anymore” and “no longer knows me” and “died to me a long time ago”. Yes, in the worldly sense, we see less and less of our loved ones as the disease progresses, but I invite you, no matter what your religious and spiritual beliefs may or may not be, to consider that, in the spiritual sense, Alzheimer’s and Dementia present a different story entirely. Mama may not seem to be here in the worldly sense but in the spiritual sense, she is more here, more vibrant, more alive and more present than she’s ever been. All I can say to that is “Amen”. For more information on Alzheimer’s and Dementia, please visit www.alz.org and www.ncbi.nlm.nih.gov. A “healer of hearts,” my husband Dr. George Rodgers is a cardiologist who heals my own heart emotionally and spiritually. He juggles his high-powered career and his numerous charitable activities with grace and dignity, while remaining the kindest, most loving and compassionate person I’ve ever known. The greatest of husbands, he is the steady rhythm in my life that pulsates throughout Symphony of Soul. I often say that he’s really an angel who came to earth to help us plain old regular folks like me. But then, in his typical humble fashion, he’ll say something equally honoring to me. An angel in our midst. We are blessed. I try and sleep but each time I close my eyes, all I can see is a dazzling display of talented musicians in front of me wailing on guitars amidst the clapping and screaming of an audience that is truly amazed! 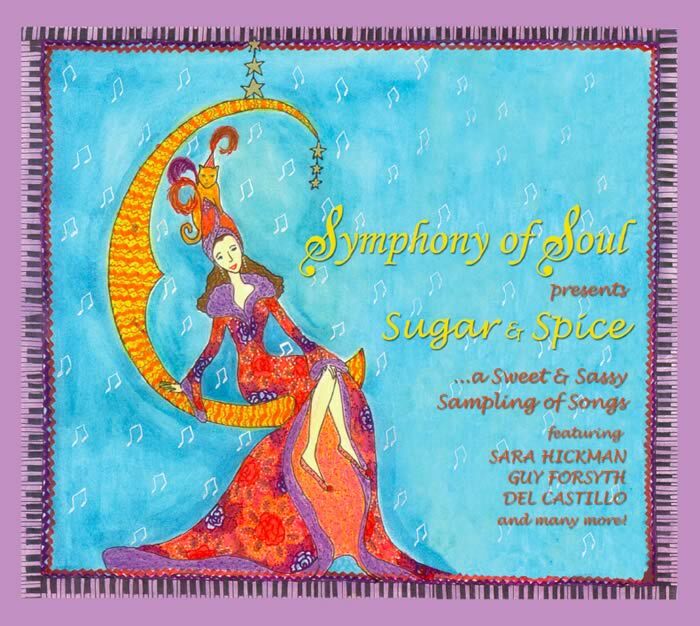 Tonight Symphony of Soul proudly released its first-ever compilation CD “Sugar & Spice”. The sizzle began with a VIP party at The Belmont where this year’s State of Texas Musician Sara Hickman transported the crowd to another realm. She really is an angel with a guitar! She’s got that adorable sense of humor, that fantastic voice and that way of strumming the guitar that just makes the audience collapse at her feet in complete devotion. We were all entranced, totally captivated, and hanging on to her every note. She very generously stayed on and played for an extra half hour, I might add, and graciously charmed each person in the audience as if singing to us one-on-one. As sought after she is in her fast-moving career, Sara somehow manages to give a great deal of her time to charity. What a woman and what a talent! Fast forward to Antone’s where The Original Recipe Band commenced the benefit concert with their classy big-band swing tunes. They played with a grace and elegance that made everyone wish they’d donned black-tie and sparkles for the occasion! Such voices and slick instrumentation! I’m always touched to see the way our musicians can perform full throttle in a public venue and then provide a smaller, yet equally fantastic acoustic performance in the intimacy of the care centers that we serve. How wonderful it was to witness this versatility in The Original Recipe Band and then again in David Cummings when he stepped up on stage to join them! He sang in that Dean Martin-ish, Frank Sinatra-esque yummy voice that always melts hearts. As we swooned to the sounds of his voice, we all wished for a smooth martini to sip on in homage to his music. Stunning! Next, the Jeff Lofton Quartet took the stage with that cool, silky jazz they do so well. Many of our friends were happy to see them play for us once again since they enjoyed the quartet so much at our Riverboat Rendezvous back in July. As always, their marvelous music, led by trumpeter Jeff Lofton, spilled out into the room like smooth satin in a seemingly effortless manner. I am fond of saying that “Jeff Lofton is a knock-your-socks-off jazz trumpeter with a teddy bear’s heart of gold”. And he really does have a big heart that he brings forth at every performance. The folks in the care centers love him, as do his many followers in public venues in Austin, New York and beyond. He makes that trumpet sing along to that upright bass and drums in a way that just makes the whole place feel hip and happening! Next the temperature changed from cool jazz to hot Latin Rock. One word: Vitera. All the women went gaga over Haydn Vitera, and not just for his handsome face! When he got out that electric violin and played that Led Zeppelin introduction to that Latin song, well, that’s when one of my women friends came up to me and said “Damn, Sister, can I just have him NOW???!! !” I proudly responded, “Yeah, he’s not only a huge talent but a real sweetheart, too! You ought to see how he engages our fragile clients in care centers when he plays his mellow sets!” That night, his violin acrobatics were so phenomenal that the entire audience stood there with our mouths hanging wide open. It was like nothing we had ever experienced! And talk about acrobatics, before we could even catch our breaths and close our mouths, guitar legend Van Wilks took the stage and somehow managed to make that guitar talk! Was it talking or singing?! “Actually,” my women friends later explained to me “it was neither talking nor singing: it was guitar foreplay, pure and simple.” Yes, that does indeed explain it! Frankly, we were all completely mesmerized, men and women alike! The women were in love and the men all wished they could just be Van Wilks for a day as they watched him channel forth the spirit of Jimi Hendrix on stage. Van Wilks is a class act and it’s no wonder he’s voted Austin’s Best Electric & Acoustic Guitarist. Not only does he dazzle the audience with his talent, he is a dear soul and a perfect gentleman who serves on our Advisory Board. We remain ever thankful for the way he opens his heart in support of our cause. Just when we thought we’d already died and gone to Heaven, Del Castillo took the stage with that heart-pounding, flamenco-Latin-Rock that makes it impossible for the audience to stand still! Before they took the stage, we were standing there in a hypnotic trance from witnessing the other fabulous musicians. Once Del Castillo started to rock the room with their wizardy, the trance melted into a wild flamenco frenzy of dancing, clapping and screaming as we all proceeded to lose our minds over them. Their powerful stage presence and musical mastery of lightning quick guitar licks and red hot rhythms makes one feel intoxicated. That’s when one friend came up to me and said, “Can I please just eat them up with a spoon???!! !” All I could say was “Girl, these guys are every bit as kind, generous and spiritual as they are talented!” I have seen them bowl over audiences in public and then again while playing acoustic sets at care centers. Amazing! Producing the “Sugar & Spice” compilation CD and launching it at such a big event is no small task. On behalf of Symphony of Soul, I am humbled by the outpouring of assistance we have received and very thankful to The Judy Greene Foundation, The Crouch Family Foundation, Davis & Wilkerson, P.C., Kevin Heady, Kamran Ziai, Brenda Ladd, Paula’s Texas Orange, The Belmont, Kate Morgan, Karla Givens, Chris Tyson, Cleve Hattersley, Sara Hickman, Lance Schreiner, Preston Sullivan, Nancy Fly, Del Castillo, Van Wilks, Haydn Vitera, Jimmy Fenno & The Original Recipe Band, David Cummings, Jeff & Dean Lofton, Bill Ham, Dave Brichler and Lone Wolf Productions, Pat Fogarty, Terra Nova Digital Audio, Matt Eskey, Gary Powell, Nikki Rowling, Guy Forsyth, George Oldziey, Suzi Stern, Craig Toungate & Susan Lincoln, Alex Coke & Rich Harney, Chaski, The Just Desserts, Sue Ann Zerre, Sharon Chan, Jenna Martin, Deb Cardinal, Bruce Kravitz, Matias Silerio, Cleve Hattersley, my beloved husband Dr. George Rodgers, Jos DenHartog, Tamra Swindoll and Hollis & Robert Gaston. To each and every one of you who attended and contributed to this celebration, I am so very thankful. It was a fantastic evening and it could never have taken place without you. This has marked the beginning of an annual tradition that will, no doubt, get bigger and bigger each year. For those of you who couldn’t be with us this time, we will look forward to seeing you next year! On July 13th and 14th of 2010, Symphony of Soul had the great honor of participating with Del Castillo on a new show for The Discovery Channel’s Discovery en Espanol. The new show ”Norte a Sur: 5 Rutas Una Experiencia: Episodio 2″ aired on October 2nd. It all began in early June when I received a phone call from my wonderful friend Preston Sullivan, Del Castillo’s manager. He explained that The Discovery Channel was launching a new show called “Norte a Sur”, a 10-Episode TV Journey that would follow five pioneering American Latinos along the Pan-American Highway. They had chosen Austin for one of the segments and, lucky for us, wanted footage of Del Castillo giving a performance on behalf of Symphony of Soul at a care center. They loved Del Castillo and they loved Symphony of Soul’s mission of providing “live musical medicine” to people confined in care centers. Marcelo Andrisani, Doug Greiff and Beatriz Acevedo of Los Angeles based Hip Entertainment Group worked closely with Symphony of Soul in attending to logistics. The production team was very respectful and kindly deferred to me to choose the best care center to participate in the shoot. I must say it was quite a challenge. They wanted to serve youth, preferably teenagers and early 20’s at-risk youth. We do serve groups such as Austin Children’s Shelter, the Williamson County Juvenile Detention Center, groups for the homeless, such as Trinity Center and facilities for those dealing with drug & alcohol addiction such as Austin Recovery. Any and all of our existing clients in care centers would’ve benefited from the musical medicine of Del Castillo. The challenge I encountered, however, was that most of them have very strict privacy laws for the safety of their clients. For instance, a child in protective custody is there for a good reason and being seen on camera could expose their whereabouts to the violent offenders who have abused them. After many phone calls, emails and site visits, I finally notified Brett Barnes at Lifeworks to let him know that I had chosen them to be the recipient of the concert. Lifeworks provides temporary housing and services to homeless youth and those who are in and out of foster care. We had never worked with Lifeworks before but we were pleased to provide this opportunity to such a well-deserving organization. We all sweated heavily but happily through two days of shooting outside in the sweltering heat of Austin in July. For the Symphony of Soul concert, the Lifeworks youth poured outside and sat in the folding chairs we had set up under a lovely old tree that provided some much-needed shade. I was struck with how many teen mothers there were, some with several young children and babies in tow. Linda Litowsky served as the wonderful production coordinator on the Austin side of things. What a sigh of relief it was to have Linda on the team handling all of the many details! She was an absolute dream to work with and I am proud to call her my friend. Artz Rib House generously donated a barbecue buffet to the Lifeworks youth and everyone involved in the project. Our wonderful volunteers helped serve everyone at the facility: Craig Toungate, David Cummings, Howard Levine, Debbie & Ken Murphy, Deb Cardinal & family, Rosie Ellis, Kellie Dobson, Frances Eckols and Tebai Yang. The show of support from my wonderful husband George Rodgers, as well as our friends, board members and colleagues was tremendous. Thank you Kevin Heady, Kamran Zaia, Craig & Jeanne Parks, Tamra Swindoll & Mario DiBlasi, Hollis & Robert Gaston. During the shoot, I loved bonding with some of the teenage girls who hungered for support and encouragement to rise above their challenging circumstances. I enjoyed being invited to speak on behalf of Symphony of Soul while on camera a few times throughout the shoot. In the end, however, Symphony of Soul’s main task was to serve as the conduit for Del Castillo to provide their wonderful musical medicine to the at-risk youth of Lifeworks. The episode is in Spanish and has had a big following on Discovery en Espanol. We were greatly honored to be able participate! Thank you to our dear friends Preston Sullivan and the wonderfully talented Del Castillo – Rick Del Castillo, Mark Del Castillo, Alex Ruiz, Mike Zeoli and Albert Besteiro for being so supportive of Symphony of Soul. We love our Del Castillo friends and it is always a privilege to get to work together! We are truly thankful to the Discovery Channel, Discovery en Espanol and all of our friends at Hip Entertainment Group for including Symphony of Soul in this wonderful endeavor. I hope it proves to be a blessing for everyone involved! On July 13th and 14th of 2010, Symphony of Soul had the great honor of being invited to participate with Del Castillo on a new show for The Discovery Channel/Discovery en Espanol. “Norte a Sur: 5 Rutas Una Experiencia: Episodio 2” aired on October 2nd. For the segment, Del Castillo was asked to provide “musical medicine for the soul” to a care center on behalf of Symphony of Soul. Hip Entertainment Group worked closely with Symphony of Soul to attend to logistics for the shoot which took place at Lifeworks for homeless youth. Please see the Symphony of Soul Blog page for more details! KEYE – October 11, 2010 – An Austin organization is making sure that all citizens who live in the Live Music Capital of the World have the ability to enjoy live performances. An Austin organization is making sure that all citizens who live in the Live Music Capital of the World have the ability to enjoy live performances.